The BSA company (Birmingham Small Arms) originally began as a precision manufacturer of light weaponry in the 1800s, hence the stacked rifles on some of their factory logos. They entered motorcycle production in the early 1900s and became, at one time, the largest builder of motorcycles in the world (25% of the world market). They built a huge variety of models, but BSA became most famous for their machines of the 50s and 60s, notably the 650 A10 and A65 twins (Golden Flash, Thunderbolt, Lightning), 750 A75 triples (Rocket 3), and 441 B44 Victor / 500 B34 Gold Star singles. While BSA motorcycles were known for outstanding reliability and were very competitive with other English and European makes of the day, times began to change in the early 60s when the Japanese began to enter the marketplace. 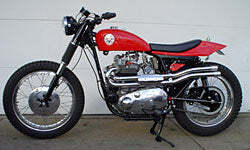 Blinded by hubris and bad management, BSA failed to see much threat in the small, strange-looking bikes from the east. Well, Japanese motorcycles didn’t stay small and funny-looking for long. And by the time the British motorcycle manufacturers realized what was happening to their market, it was too late. 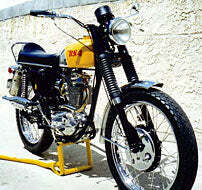 BSA ceased production of motorcycles in 1972.